« Homepage / Other Drugs / "Emesan K kids cone /-E adult suppositories"
Diphenhydramine is used for the short-term treatment of sleep and sleep disorders (insomnia). The effect uses 30 to 60 minutes after ingestion of tablets and suspends two to six hours. A second area of application is nausea, against which the drug both in the form of tablets such as Pessaries can be used. Diphenhydramine is one of the active group of H1 antihistamines and has a predominantly calming effect. As a result, sleep and sleep disorders can be treated. In addition, allergic reactions are alleviated and reduced nausea. Diphenhydramine competes with the endogenous neurotransmitter histamine. The main function of histamine is in the Premier League of bioinformativs substances. The neurotransmitter uses this certain receptors, the so-called H 1 receptors. An excess of histamine in the skin can include itching, a surplus in the brain can cause nausea and vomiting. Diphenhydramine counteract this surplus in the brain such as the rest of the body by binds to the H 1 receptors and they occupied instead of histamine. The binding of diphenhydramine h can reduce allergic complaints 1 receptors outside of the brain (peripheral receptors). Bind to H 1 receptors in the brain (Central receptors) is responsible for calming (sedating) and nausea-relieving effects (anti-emetische). Diphenhydramine is similar to the active ingredient of Dimenhydrinate. 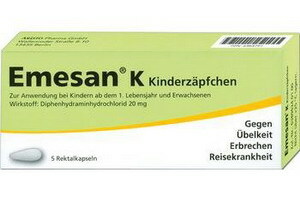 Emesan K for children contains 20 milligrams of Diphenhydraminhydrochlorid. This corresponds to 17,501 milligrams of diphenhydramine. Emesan E for adults contains 50 milligrams of Diphenhydraminhydrochlorid. This corresponds to 43,753 milligrams of diphenhydramine. The medication can affect the ability to driving and the appropriate handling of machines. This applies particularly in the interaction with alcohol and insufficient sleep duration. The drug can distort even three days after the capture of allergy tests. Use of the drug over a period of time can lead to a certain habituation. This means that higher doses for the usual effect is needed. At the end of a prolonged use of the drug, sleep disorders are possible, which can be prevented by a gradual, gradual dose reduction. Use of the drug over a period of time or in higher doses can cause a teaches. The drug should be used only briefly and in the specified dosages. For allergy tests, false-negative results are possible. What interactions of the active substance diphenhydramine in Emesan K kids cone/-E adult suppositories are known? It is important to note that the interactions can be different depending on the pharmaceutical form of the drug (for example, Tablet, syringe, ointment). Diphenhydramine may be taken alongside alcohol and other, dampening the brain function agents (hypnotic, Beruhingungsmittel), because it is possible to effect gain or unforeseen effects. Diphenhydramine may be taken at the same time with antidepressants of the active group of MAO inhibitors and the Tri and tetrazyklische antidepressants. Diphenhydramine should be taken at the same time with herzwirksamen drugs such as antiarrhythmics or potassium-dewatering equipment. The simultaneous use of diphenhydramine with Muskarin receptor antagonists such as atropine should be avoided. Diphenhydramine should be taken at the same time and applied locally (E.g. as ointment). In the simultaneous capture of diphenhydramine and hypotensive means, there may be increased fatigue. Because diphenhydramine for allergy tests can distort, these tests should not be during the use of the active substance and at least three days afterwards. Suppositories for adults: for children over twelve years and young people a dosage of 50 mg diphenhydramine applies once or twice a day. This is equivalent to one or two suppositories. The maximum daily dose is 100 mg. Up to three times a day, adults can also introduce a suppositories with 50 milligrams of diphenhydramine. Daily dose: 150 milligrams. Suppositories for children: for children between one and five years are a sufficiently up to twice daily 20 mg (suppository) diphenhydramine (maximum daily dose: 40 milligrams). School children between six and twelve 20 milligrams of diphenhydramine can be given up to three times a day (maximum daily dose: 60 milligrams, three cones). For children under one year, there are Emesan S infant suppositories. The following information on contra-indications in the application of Emesan K kids cone /-E adult suppositories in General, pregnancy & breast-feeding and children. It is important to note that the contra-indications can be different depending on the pharmaceutical form of the drug (for example, Tablet, syringe, ointment). When are Emesan K kids cone /-E adult suppositories not allowed? slow heartbeat (bradycardia), or other disorders of the heart function. Only after medical risk benefit the diphenhydramine by patients with impaired liver function, not current asthma bronchial and narrowing of Magenausgangs (pyloric stenosis) are applied. Diphenhydramine may not be taken during pregnancy and breastfeeding. Diphenhydramine must be given only in age-friendly dosing infants, children and young people. In case of doubt is to consult the pharmacist or doctor. What side effects can the active ingredient diphenhydramine in Emesan K kids cone/-E adult suppositories have? Below, you will learn the most important thing possible, well-known side effects of diphenhydramine in Emesan K kids cone/-E adult suppositories. These side effects should not occur, but can. Because everyone reacts differently to medications. Please also note that the side effects in type and frequency can vary depending on the drug form of the drug (for example, Tablet, syringe, ointment). Common side effects: dry mouth, heart palpitations, feeling a stuffy nose, blurred vision, intraocular pressure boost, urinary voiding dysfunction. Very rare side effects: blood count changes in granulocyte absence, white blood cell deficiency (temporary and declining). Side effects without specifying the frequency: digestive problems (nausea and vomiting, stomach pain, constipation, diarrhea), mood swings, allergic skin reactions, skin sensitivity, hepatic dysfunction. in children: restlessness, agitation, tremor, insomnia, anxiety. The local application, there may be a hypersensitivity reaction in rare cases.